Zelda set down her utensils with a loud clink! Were she not so famished, her apetite might have been ruined, but her stomach protested her negligence loudly as she stared across the table, wide-eyed, holding her tongue from saying exactly what she thought of her father’s repeated question. Are you, though? She sighed heavily. Fine. If he was going to play ignorant, she could play, too. And, ultimately, she did not need his approval. She knew this game of royals. Seventeen years had not left her bereft of strategies of her own. “Fine, then where do you expect us to get the labor to build this village? We are having enough trouble feeding everyone, providing security, and balancing the demands of those lords and ladies you hate so much. Explain that.” The king’s level tone hardly served to calm her. And, there it was. The last of her nerves breaking. The culmination of her frustration with herself and her thick-headed father finally snapped like a fragile thread in her mind, and she stood from the desk. “She has taught me more than you ever have,” she seethed, teeth clenched. The flood of sorrow, hate, and regret beat against her chest. “No. You may have time to eat, but I have a village to build. Under my name, to save you the embarrassment and retaliation of your court. But, mark my words,” she thrust her finger against the desk in a pointed manner, “when that crown becomes mine, at least my people will know me to be decisive.” And before he could say anything else stupid or heartless, she stormed out the door and into the library, just as the tears began once more. Yoro could not help but stew in his own failure. Not anyone else’s. His own. There had been much that he had not expected, and that was on his head, no matter how many times he considered it elsewhere. The strength of the initial Royal Guard escorts, especially the princess’s “advisor,” had been completely unexpected. Had he have known the advisor to be a Sheikah warrior, the original scouting party might have been made sufficient. Or perhaps more stealthy. Then, there was that boy with the wooden shield, who had stopped him from killing Zelda when it should have been so easy. Some sort of lackluster guard who tired quickly and fought with a blind eye. And apparently held a piece of the Triforce. How was the kid special? Yoro himself had broken the shield, and he was fairly certain he had shattered the arm beneath like a toy, a doll. Yet, according to Yoro’s voice-within-the-walls, the boy now followed that worthless princess around like an equally worthless dog, perfectly healed, perfectly obedient. What part of that made someone worthy of something so coveted? Two children, two pieces of the Triforce. The goddesses are an absolute joke. And then came the exploding arrows… Yoro growled, torn between admiration and frustration. They had burned him, blinded him momentarily, causing struggle as he cast around for his foe’s death or his own escape. Such wonderful, beautiful technology, he had to admit. Who had come up with them? It didn’t matter. He would find them. Or find a way to recreate them. They were extremely useful, and that man who wielded them had driven Yoro back like he was nothing. “And once you kill the princess, then what?” A voice he did not recognize caught him completely off guard. Yoro spun around to its source and drew his blade. Its polished silver and onyx glimmered in the light of nearby campfires, a menacing greeting to this unwelcome intruder. The man was an elderly Hylian, to be sure, with gray eyes and a grizzled face like leather. And he wore a beat-up set of plate armor from the Hyrulean Royal Army; it had clearly seen better days. But he had the build and carry of a soldier – large, muscular, formidable and confident. A presence to rival Yoro’s own. A Colonel. Maybe even a General. The broadsword at his back shifted as he adjusted his perch on a large rock just outside Yoro’s tent. “Who are you?” Yoro demanded, blade unwavering at neck-level. The man barely even seemed to notice the weapon; his eyes were fixed up into Yoro’s face. “Do you often answer questions with questions?” General. The man absolutely possessed the attitude. His smirk also gave it away. The man shook his head. He pressed his palm flat against Yoro’s claymore and pushed it down. For a moment, Yoro hesitated, then lowered the weapon. He wouldn’t sheath it, though. There was no telling who this guy was or what his intentions were. “The death and downfall of the royal family, of course. I have spent years in service to the crown, fighting wars in the name of the king’s ego. My men and I were sent to die in his stead for far too long. I left on my own accord, not his. Now, I feel I am owed a debt and I wish to collect it. “So we are back to my initial question.” The man sauntered past Yoro, stupidly exposing his back. Yoro considered running him through, yet something about him kept the claymore down and unbloodied. One of his underlings thought otherwise. The man stopped in his paces as the sound of clanking metal began. The man glanced down at his hand, then whirled around and thrust it forward. Like from thin air, a dagger soared just past Yoro’s face. Yoro watched it in slow motion as it flew and impaled into the neck of one of his Lieutenants, who had begun to draw out his weapon. The dagger slipped between two pieces of armor: the helmet and the chestplate. The Lieutenant froze, gurgling, his hand slipping from his partially drawn weapon, and sank to the ground, dead. Yoro heard the man whisper something about, You’ll find I’m better trained than the average soldier these days. He stared, mouth open in shock, as the man casually examined his nails before chewing one off, like nothing had transpired. He didn’t have an answer. He really didn’t have words at the moment. For the first time in his life, Yoro realized he had been cornered. This awol Hyrulean General, whoever he was, had snuck into his existence, and would now completely take over, hitting him like the broad side of a battle ax. And Yoro had never seen it coming. 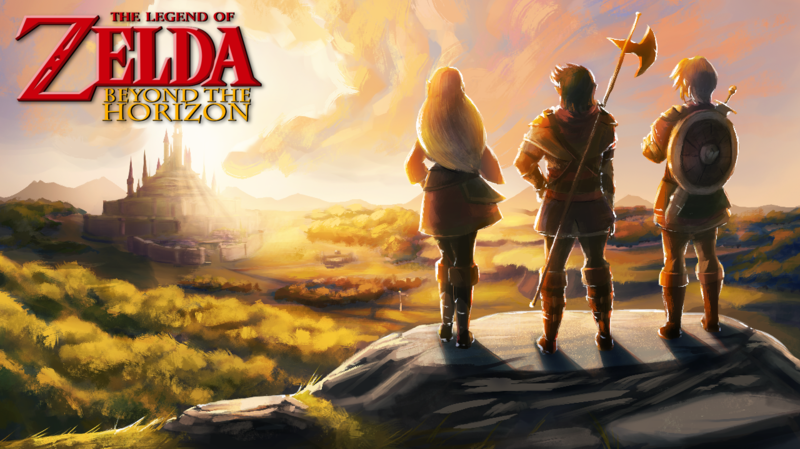 Beyond the Horizon is a collaboration between Adam Barham, Jarrod Raine, and Kat Vadam. Feel free to follow them on Twitter!